Sleek and modern with a luxurious touch, this round end table is sure to elevate your living room decor. 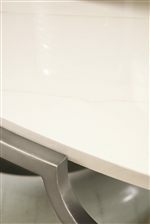 Faux marble Carrara is used on the top and shelf, providing a smooth surface that creates an upscale feel in any room. The shelf offers space to store magazines or books, and a solid steel frame in an Oxidized Nickel finish brings a clean, modern element to the piece. The Morello Round End Table with Faux Marble Top by Bernhardt at Janeen's Furniture Gallery in the Visalia, Tulare, Hanford, Porterville, Exeter area. Product availability may vary. Contact us for the most current availability on this product. Chic meets sleek in the stunning Morello collection of occasional tables. Tables feature faux Carrara marble tops and shelves for an upscale, luxurious look. 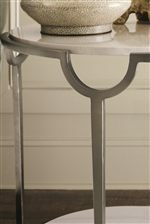 Solid steel bases in an Oxidized Nickel finish keep the look polished and modern, with simple geometric shapes bringing the tables into a more contemporary state. The Morello collection is a great option if you are looking for Contemporary furniture in the Visalia, Tulare, Hanford, Porterville, Exeter area. Browse other items in the Morello collection from Janeen's Furniture Gallery in the Visalia, Tulare, Hanford, Porterville, Exeter area.